Just yesterday, the reveal of a new Iron Man toy gave us out first glimpse of the character’s new armor in the upcoming ‘The Avengers 2.’ The trend of toys jumping the gun continues today: a German ad for the first wave of LEGO sets based on Joss Whedon’s superhero team-up sequel has made its way online and it may very well tease some setpieces and concepts that haven’t been present in any of the trailers thus far. It always happens like this: a studio bends over backwards to protect their latest blockbuster’s biggest secrets and then a toy company accidentally spoilers something. So consider this a spoiler warning because we’re going to assume for a paragraph or two that this ad contains scenes that are directly based on the film. Sure, the imagery here could have just as easily been cooked up by LEGO because it looked cool, but let’s just play the speculation game for a moment. As you can see in the ad below (click on it to take a closer look), some of the sets are pretty standard. There’s Iron Man in his Hulkbuster armor taking on the Hulk, and a Quinjet set (complete with Vision!). 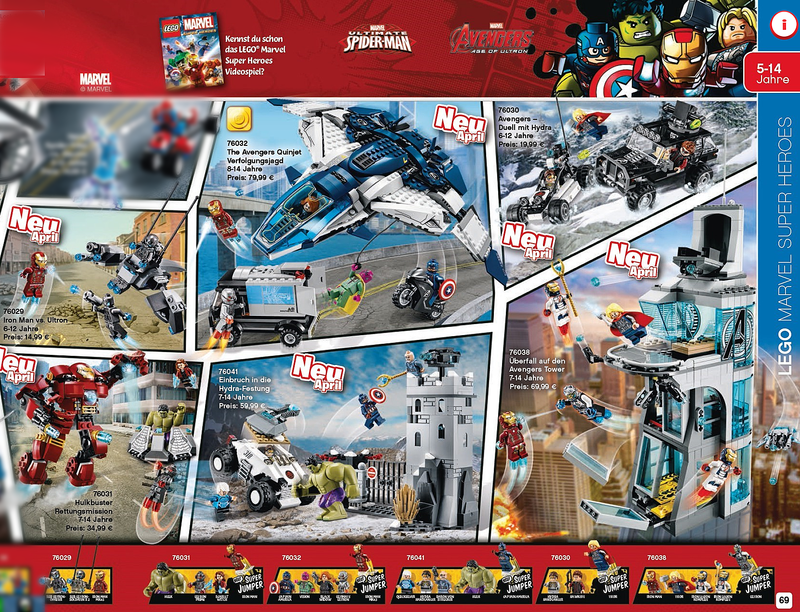 But take a moment to look over the set in the bottom middle, which features the Avengers, a castle, and a LEGO minifig version of Baron von Strucker, the villain who made an appearance in the mid-credits teaser of ‘Captain America: The Winter Soldier’ (where he was played by Thomas Kretschmann). We already knew that the film opened with the Avengers storming his hidden base where he was holding Quicksilver and Scarlet Witch captive and had all kinds of crazy experiments going on. And, of course, he was in possession of Loki’s sceptre. Which his LEGO version appears to be wielding, by the way. But that’s not the most curious thing about all of this. The set to the right of that one appears fairly normal at first, depicting the Avengers tower. But look at the name of the set: “Fall of the Avengers tower.” And look at the extra Iron Men flying around, who are apparently called “The Iron Legion” according to the character cheat sheet at the bottom of everything. Most importantly, note that one of the “Iron Legion” is carrying Loki’s staff. We could make a whole bunch of outrageous guesses about what this means, but it seems pretty self-explanatory. So we’re just going to say “huh.” Huh. Minifigs included with in these sets are: Iron Man, Iron Man (Mark XLV Armor), Thor, Hulk, Black Widow, Hawkeye, Quicksilver, Captain America, Vision, Scarlet Witch, Baron von Strucker, Ultron, Ultron Prime, Ultimate Ultron, Sub-Ultron Soldier, Hydra Henchman, Iron Legion Accomplice. According to the image below, these sets appear to be arriving in stores this April. Meanwhile, ‘Avengers 2’ itself will open in theaters on May 1, 2015.